This vegan version of the tahini-based "goddess" dressing found in many health food stores and restaurants is easy to make at home. If you like the store-bought goddess dressings, you'll love this one made with tahini, lemon juice, and parsley. It is egg-free and dairy-free, unlike traditional green goddess dressing. You can find many ways to use this goddess dressing besides dressing a green salad. Use it to make coleslaw instead of mayonnaise, to dress plain steamed vegetables, and to put on leftover pasta to make cold pasta salads. It's a great substitute for ranch dressing as a dip for plain veggies such as carrot sticks and cucumbers. There are easy substitutions to make for special diets. If you need it to be gluten-free, use a gluten-free tamari instead of soy sauce. You can omit the agave nectar or sugar if you need it to be sugar-free. But the sugar does add an extra layer of flavor to make it truly special (and its just a little bit). To a blender or food processor, add the tahini, apple cider viengar, soy sauce, lemon juice, garlic, water, dried parsley, and agave nectar. Puree until smooth and creamy. Next, slowly add in the oil until well mixed. Taste, and adjust ingredients to balance them. If you like a little sweeter dressing, you can add a little more agave nectar or honey, or if you like a saltier dressing, you can add a bit more soy sauce or tamari. The dressing will be thick, but you can always add a bit more water if you prefer a thinner consistency. Pour the dressing into a serving container. Refrigerate the dressing in a sealed container. It is best when used in seven days of preparation. The olive oil and tahini will thicken when refrigerated, but the dressing will thin out when warmed to room temperature. Running the container under hot water can help reliquefy it for use. Tahini is a paste made from ground toasted sesame seeds. It is often used in Mediterranean and Middle Eastern cuisine. It provides protein, iron, calcium, and phosphorus. Sesame seeds have more healthy plant phytosterols than other nuts and seeds, with cholesterol-lowering effects. 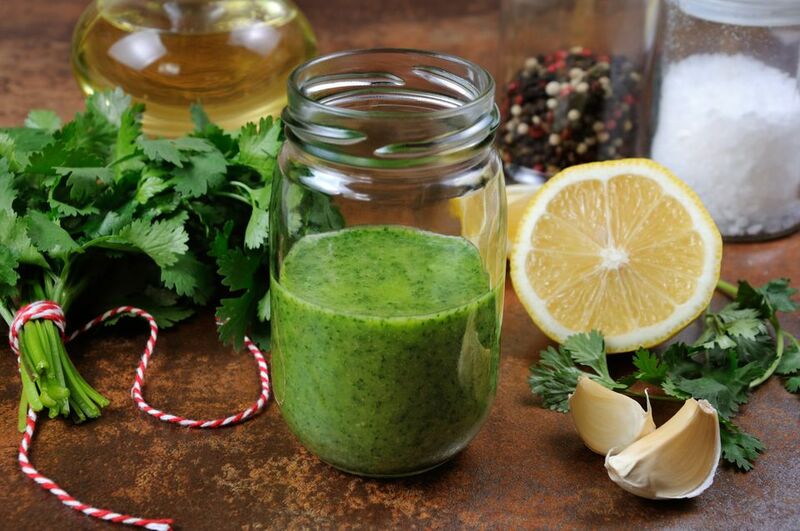 Making homemade salad dressings such as this one is very simple, as long as you have a blender or a food processor. The second best option is a manual hand-crank egg beater. If you don't have any of these tools, you're in for a lot of stirring by hand. Stir everything together as much as you possibly can using a whisk, then transfer everything to a glass jar with screw-top lid (or another airtight container) and shake vigorously.